i don’t like reading the newspaper. i don’t like how it feels on my fingers, i don’t like the oversized pages and i don’t like having to search for the remainder of an article. for this assignment, i did try “reading” though a local paper-2 in fact-and came up with a reaffirmation of a fact i already knew: i don’t like the “news” in general. it is too depressing and upsetting…death, destruction, corruption, money woes…these seem to be the current topics. i tried to read but instead i found myself skimming and skipping and completely avoiding the currents events printed before me. i flipped the oversized dirty pages back and forth searching for something worth reading but after a sentence or two i moved on, afraid to commit to a futile story. my goal changed from finding and responding to specific news topics each day this week to successfully reading one newspaper article, start to finish. i finally found a story i could relate to that didn’t make me want to cry: daylight savings time. seeing as though daylight savings time begins tomorrow, the above article caught my eye, and i must admit i learned a thing or two! did you know that congress started officially regulating time in 1966? that sounds quite presumptuous and unnecessary to me. 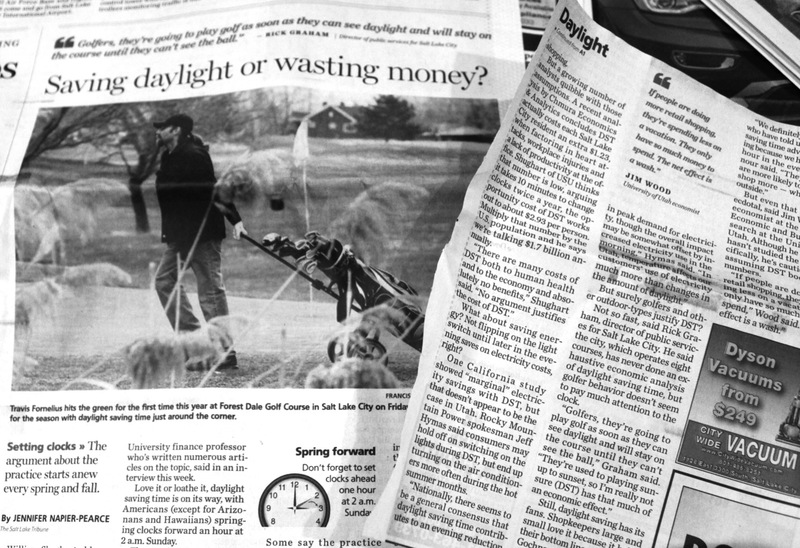 i have never been a fan of daylight savings and i’m even less of a fan now after reading Jennifer Napier-Pearce’s article in the Salt Lake Tribune. daylight savings time does interfere with our biological rhythms, not only effecting our sleep patterns and creating some grumpy mornings while adjusting, but also contributing to a rise in auto accidents and hearts attacks in the days following the time change.